Mark your calendars and make this the day to come show your support for our local lifesaving rescues at our “Fosters to the Rescue” event at Foothills Mall on November 15th, 11:00am to 3:00pm. 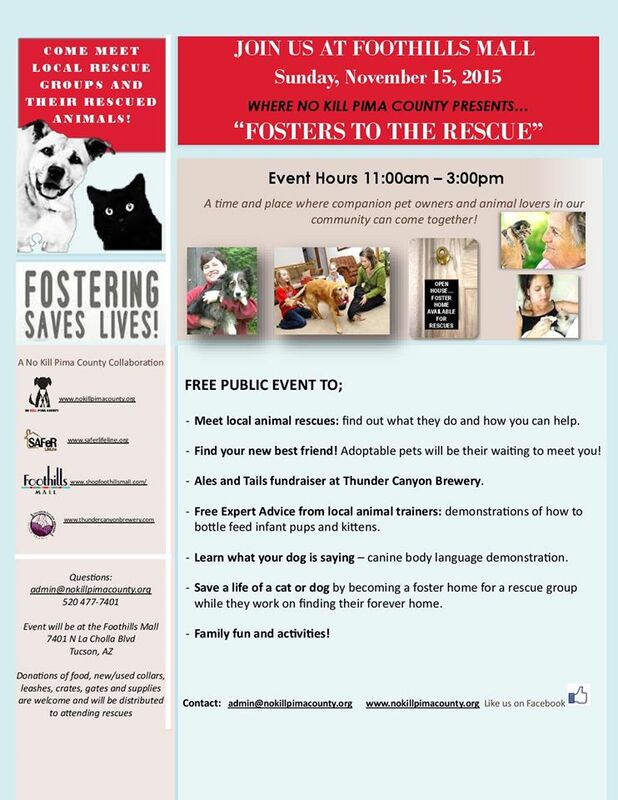 Fosters to the Rescue has been a staple event of No Kill Pima County. We seek to combine and support all the primary needs of our local rescue organizations: generating awareness, raising funds, promoting adoptions, recruiting fosters and help with the application and homecheck process of fosters. As always, our third annual event will create a place for the public to come and meet many of our local rescue organizations in one place, at one time and learn how they can help. This year we are expanding and offering more activities than ever before, including a busy public venue only for rescues to present their dogs and cats for adoption; interactive educational presentations for existing fosters and information for companion pet owners. Our Ales and Tails fundraising at Thunder Ridge Brewery will support rescues pulling urgent and special needs cats and dogs from Pima Animal Care center. Please come have lunch and/or ale! This year we also ask current fosters to join us in a “Foster Challenge and Rewards Program.” We believe that Fosters are the “lifeline” needed for rescues to pull and save more animals, along with funds of course! However, we have seen situations where a rescue is willing o pull an animals, pledges are posted, transportation is offered…but no foster is available. Too many times this has resulted in the fate we all dread and wish to change. We know of no one better than the current and amazing fosters and volunteers to recruit new fosters. Those with the experience of being a foster and lifesaver are the best ambassadors and advocates for the animals in need. We challenge exiting fosters to recruit a new foster by asking their family, friends, neighbors, their kids’ friends’ parents and school teachers, groomers, co-workers etc. to become a foster and bring that recruited foster to the event on the 15th. And the reward? For every newly recruited foster, you receive points when they foster their first animal for a rescue organization. Once they see the animal through to adoption, you receive more points. Those points can be used like cash or banked and saved and can be redeemed whenever you wish, to apply them to the sponsorship an animal of your choice at Pima Animal Care Center. This year we have secured a venue that not only accommodates all of the above, it give rescues the opportunity to engage with a more diverse audience in an already public place: Foothills Mall. We can’t think of anything more important to do that day then come on out and join us and help support our well deserving rescues, as well as help them succeed in getting lots of their existing animals adopted into their new homes and families right before the holidays. We can’t think of anything more important to do that day than to come on out and help support our well deserving rescues, and meet some of their existing adoptable cats and dogs hoping to find their new homes and families their right before the holidays. Let us know you are interested or will be joining us on our event page and invite others to join you.